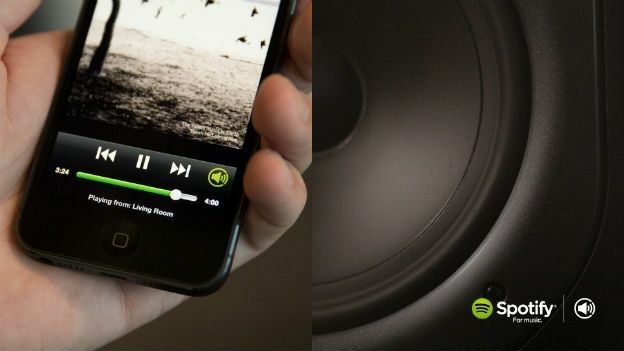 Spotify has revealed a new audio experience that it hopes will mean the end of Bluetooth streaming or having to physically dock your device to play music through speakers. The new system is called Spotify Connect and works by communicating directly with Spotify's servers from a speaker or dock using the internal Wi-Fi chip and your home network. Because the new system doesn't rely on a connection between your mobile device and the speaker itself, the audio isn't interrupted by an incoming call or a dropped signal. Your phone or tablet instead becomes a remote control that you can use it to do other things, like playing a game, without interrupting the music. By building the technology into the Wi-Fi chips that most modern hardware manufacturers already use, the functionality is added with no extra cost to the OEM. That has allowed Spotify to line up an impressive number of hardware partnerships, including: Bang & Olufsen, Yamaha, Pioneer, Philips, Denon, Marantz and others. The Swedish-based streaming company has also unveiled a new logo, pictured above, that will be displayed on all compatible hardware devices and be added to the Spotify app. The ultimate aim, Spotify tells us, is that its service will become as ubiquitous as the CD player was previously - available as standard in sound system hardware. The new Spotify Connect service is already ready to go and will be rolling out to Premium subscribers in the coming months. At first the service will be limited to iOS devices, but Android and desktop variants are planned for the end of 2013 and the beginning of 2014.